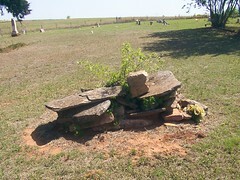 This is a very old cemetery in southern Grady County. A post office was established in 1892. 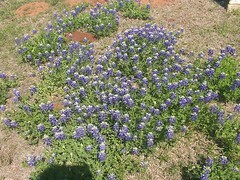 From Marlow,OK. go east on OK 29 for 8.8 miles, turn north on Bailey road and go 5 miles, at the "T" intersection turn east and go 1 mile, cemetery is on the south side of road. This is old grave, it is supposed to be and Indian grave. Antidote: It is a old tale,that if you walk up to the grave and ask what are you doing, you will hear nothing. 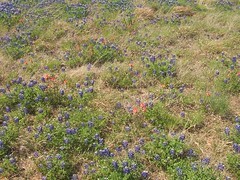 These are wildflower, Blue Bonnets and Indian Painted Brush. My grandfather, Uncle, and a infant cousin are buried in this cemetery.